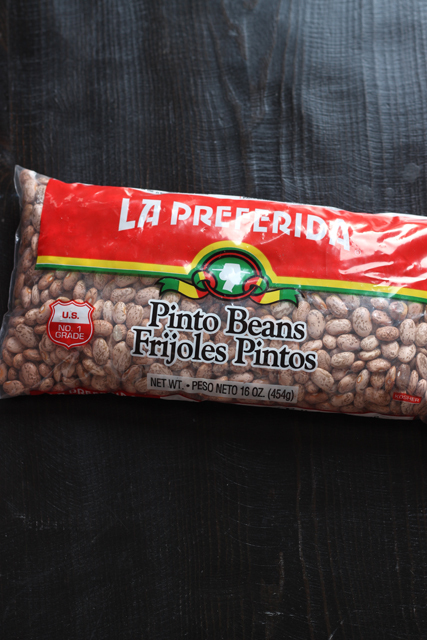 Cooking pinto beans from scratch is a great way to enjoy beans as a side dish or as a meatless main dish. They are so much cheaper than canned beans. Since both my husband and I grew up in Southern California, Mexican food is a cuisine that is near and dear to our hearts. I serve it for dinner at least 2-3 times per week. Making my own beans (as opposed to buying canned) is a great way for me to feed our growing family and stay under budget. Years ago I tried it, but we didn’t really like it. I could never get the beans tender enough. But, desperate times call for desperate measures. When I could no longer buy canned beans for a good price (<$0.50), I tried to make my own again. And it’s working! The trick has been to cook them long and to season them well. Soaking them for a long time and cooking them in the slow cooker seems to help them get tender and less gassy. Plus, cooking them myself is proving to be much cheaper than fifty cents a can. The bag pictured cost $6.39 at Costco. At $0.64/# I can make the equivalent of 4 cans of beans for a lot less money. Here’s how to make a pot of beans yourself. It’s best if you start the night before. Sort through the dry beans to make sure there are no stones mixed in. I also like to pick out any broken beans or those whose skins are broken. In my experience the smoother beans cook and taste better, but it’s been a little tough to find really fresh beans, those that are dried, but not so much that their skins have started to whither. Sometimes, you just have to go with it. It’s easiest to lay the beans out on a cookie sheet and remove those that aren’t smooth and whole. Transfer the beans to a colander and rinse them well. Transfer the beans to a pot or large bowl and cover them with at least two inches of water. Allow them to soak overnight, up to 24 hours. I’ve found that the longer soaking time prevents the cooked beans from being gassy. Drain and rinse them before cooking them. Next I put the beans in a slow cooker or pot on the stove and allow them to cook until very soft. You want the skins to peel off when you blow on them. Scoop up some and blow. If the skins aren’t tender, let them cook a little longer. The beans will need a fair amount of salt, but sometimes adding salt at the beginning has made the beans tough, so I add the seasonings near the end of the cooking time. I like to cook several pounds at once. Sometimes I even use two crockpots. I portion the cooked beans into two-cup containers which is basically the equivalent of one can. Cool them, chill them completely, and then stash them in the freezer to use in recipes. 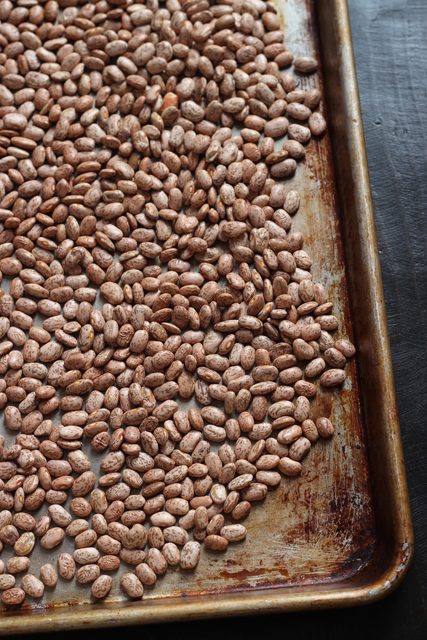 You’ll save money and enjoy great, tasty beans. Use the beans in recipes. Sort through the dried beans, removing any stones or defective beans. Rinse thoroughly. Place in a pot and cover with at least 2 inches of water. Allow to soak overnight or up to 24 hours. 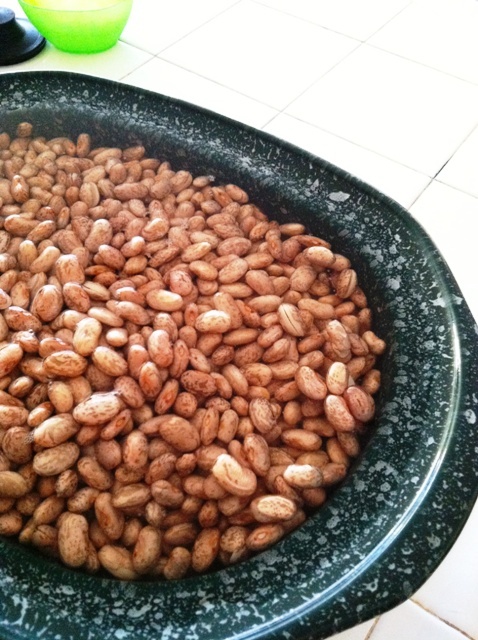 The next day, rinse and place beans in a slow cooker. Add the chopped onion and enough water to cover by about an inch. Cook 8-10 hours on low or 6 on high. Stir in salt and pepper to taste. We like to mash the beans slightly and season to taste with garlic powder. *If you don’t want to use the crockpot, or if you don’t have 8 hours until serving time, you can cook them on the stovetop. Place beans, onion and water in a large stockpot. Bring to a boil. Reduce heat to a simmer and cover slightly. Stir frequently, adding water if necessary. They should be cooked in two to three hours. To freeze: the beans can be frozen for a later date. 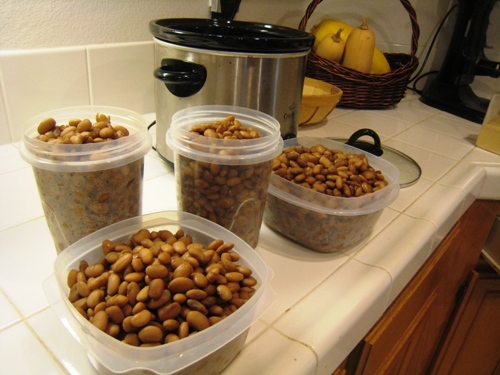 Simply cool and divide the beans into meal size portions in airtight containers. I add some cooking liquid as well. Chill completely before freezing. To serve: thaw completely in the refrigerator. Reheat and serve. Thank you so much for this! 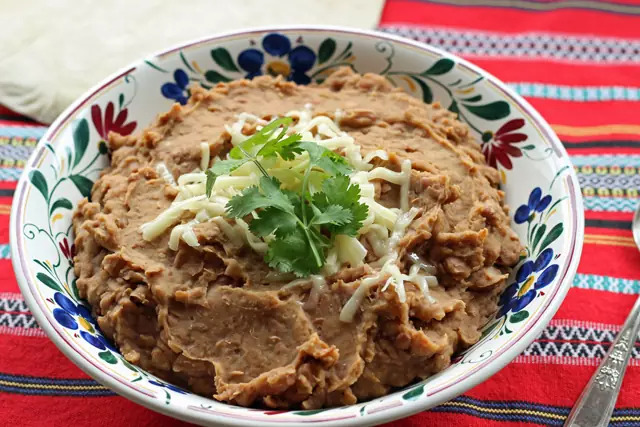 We go through a ton of refried beans around here as Mexican food lovers ourselves, and this not only helps us with that but is a great recipe to have since we’re going vegetarian and need vegetarian refried beans. Thank you, thank you!! I made these this morning. I’m wondering at what point I should freeze them? Before the mashing? And will they be that lovely dark brown color eventually or do I need to add something to them once they are mashed? This is my first time making them and I am NERVOUS!! I’m not sure about the lovely dark brown color. Mine aren’t light, but I never paid attention, I guess. You can freeze them anytime after they are cooked and cooled. Mashing before or after is totally up to you! You’ll do great! @Amanda, Seems you are thinkingof the canned Baked beans which has brown sugar and molasses in them. My mexican heritage taught me to add fresh minced garlic and a jalapeno to the pot. Just a pinch of cumin adds flavor too. I always do mine on the stove (a couple of hours on low). Thanks for the crock-pot version! Ooh yum, cumin! The fresh garlic & jalapeno sound good too…. I am cooking beans as we speak, after soaking, I have it as low as the stove can go and after 20 minutes they are just mush, certainly wouldnt have to mash them. Any insight? cant imagine cooking them hours etc. I am not sure what that is. That seems really odd that they would be mush after only 20 minutes cooking. Were they fresh beans or dried? @Jessica, they were dried, soaked then frozen. @sona, I’ve never frozen soaked beans without cooking them first. Was there a reason that you did it that way? @sona, freezing will do that to a lot of food, it causes cell rupturing similar to cooking. As an example, apple sauce can be made by either cooking or freezing the apples. I’m going to give this a try again. Always had an issue with them not getting soft enough, too, so I’ll give her a try! Thanks! I forgot how tasty homemade pintos can be! I soaked mine for 24 hours, cooked for 4 hours and left on warm until dinner time (4 hours?). They were great! I pureed 4 C pintos, 3/4 C liquid, 1 t onion powder and 2 t Better Than Boullion beef. These disappeared! We used these as a side to taco salad last night. Yum! those were the best beans i have every made! SO easy in the slow cooker..wow..and talk about frugal..we will definitely be eating more beans around here..not to mention the health benefits! thank you! 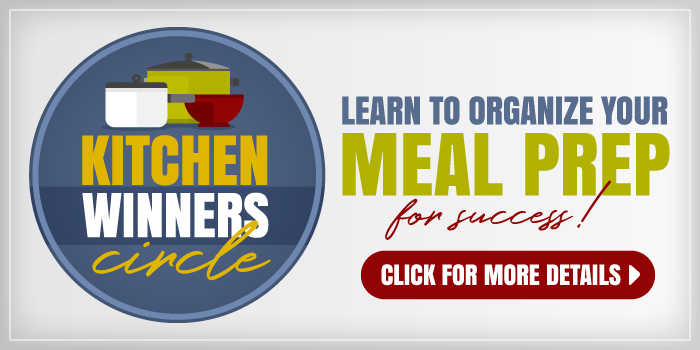 Have you ever tried a pressure cooker? Im 28 and had horror stories of them popping their lids back in the day, but the news wont do that. After a great score with a gifted brand new pressure cooker that my MIL was scared to use and alittle internet research, this thing is my new fave kitchen appliance. The short cooking time is only an added benefit to the FLAVOR this thing can turn out in anything you make. Beans and Pot roast are my faves so far for it! I’ve always been scared of them. But, yes, I have heard good things about the new ones. Thanks for the tip! Adding this to my list of things to cook! I did a big batch of pintos a few weeks ago! I did the quick-soak (cover with water, boil 2 minutes, let stand, drain) and then cooked them on the stove. I drained off most of the excess water and packed them in freezer bags in “can-sized” amounts with a smidge of the “bean juice” from the pot. They thaw beautifully in the microwave! This has made my diet so much easier to stick to, having nutritious, non-chemical foods handy in my freezer! My fiance even ate beans the other day! @Kelly, that is wonderful! So glad that it worked so well! I add green chiles, garlic, cumin and cilantro in addition to the onion when I make mine. We use my “smushy” beans for tostadas and burritos. I was just thinking about doing this last night–I’ve tried it just once before like this, but my husband actually preferred the canned beans. Maybe it was just the change though. I have the same exact bag of beans, too. Thanks for the suggestion. I’ll try this again this week. Thanks so much for a great recipe!! YUM! Yeah! Doing a happy dance with you! we have really enjoyed receiving your postings- some great ideas! preparing beans- you did not mention- or i missed it- using a stove top pressure cooker for beans- we found that the beans still need to soak over night, but then 20-30 minutes in the pressure cooker, and the beans are ready to be used. great time saver for our cooking needs right now. just me, but i like the pressure cooker better than using a crock pot. @bob taylor, I’m scared of the pressure cooker. But, thanks for the tip! @Jessica, when we started pressure canning about 3 years ago- i was petrified that the thing was going to blow up and punch a hole through roof– learning on the internet quickly relieved that concern- you would have to be working serious over time to make modern pressure canner or pressure cooker blow up- maybe Mythbusters could do it, but it is beyond the ability of most people because of all the safety features. 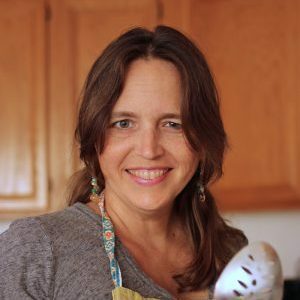 explore some of the pressure cooking websites out there- a little education will relieve your concerns- it’s a lot of fun when you get going. In south Georgia we don’t mash ours. We serve ours as soft peas. We boil fresh(not smoked) hamhocks to season our pinto beans. Boil hamhocks on high til they start boiling, then turn heat down to med. or med. high til you have a good broth(usually 45 min. to 1 hour). Drain pinto beans from soaking, add to hamhock broth, salt and pepper. Bring back to a boil and then turn heat down letting cook slowly til done. (can be cooked in crock pot also). Add onions if you like, either while cooking or sprinkled on top when you serve them a bowl. Makes the whole house smell good!!!! Cook a pan of cornbread and you have a wonderful meal!! So I want to make my own black beans for black beans & rice…not thinking mushy beans will go over well with the fam, but trying to cut my love affair with canned beans! Any tips on making them differently, or just follow this recipe? Thanks – as always, you rock! @TallyMichelle, I haven’t gotten too creative with black beans. Usually do them this same way. Serve over rice. We like to add grated cheese on top, along with green onions and red bell pepper, diced. Some folks splash with vinegar (balsamic? ), but we love it as is. I ask for one slice of ham at the deli counter, and ask them to cut it on a ’12’ (makes about a 3/4 inch slice of ham). You should see the glazed eyes when I first ask for one slice of ham! But they always perk up when I explain I want if for beans. I realize that the ham makes it more expensive, but still, at 88 cents or less for a bag of beans, this is a very inexpensive meal and serves my family of 5 about 1.5 times, for about $6.00 total. DH always takes leftovers to work the next day – and he never liked beans before! Thanks for all the tips here. @Rhonda, Shame on me! I didn’t tell you what to do with the beans after you add the other ingredients! Return to a boil, then turn the stove down to low. Let simmer for 1.5 hours. If there is a way to edit my first reply, I’d love to add these directions in the recipe….can’t seem to find the edit button, but I sort of panicked when I realized I left this impt. info out! I just LOVE this web site. I’m a disabled senior citizen, living alone, on a limited budget. I belong to a food support “Club” — Fare For All (there’s Angel Network, too) where you get X amount of food for a really good price. The caveat is you don’t always know everything that you’ll be getting. Now and then we get pound bags of beans. I don’t care for “naked” beans (except green beans), so I’ve only used the kidney beans to make chili. When I’ve made hotdishes or soups, I often wish I had a handful or two of beans to throw in. I didn’t think of cooking and freezing them even though I’ve frozen the chili! When I have the energy, I’m going to soak and cook a pound )in the crockpot), and package them in snack-size zip lock bags, putting all the little bags in a gallon freezer bag. Then I’ll have a handful or two to use in a hotdish, stew, or soup. Thanks for all the ideas you cooks have shared. I’m proof positive you CAN teach old dogs new tricks! Thanks for the recipe! I have these in my slow cooker now. I’m just wondering if I drain the liquid before mashing. I still seem to have quite a bit in there. Thank you. Yes, drain some of the liquid. 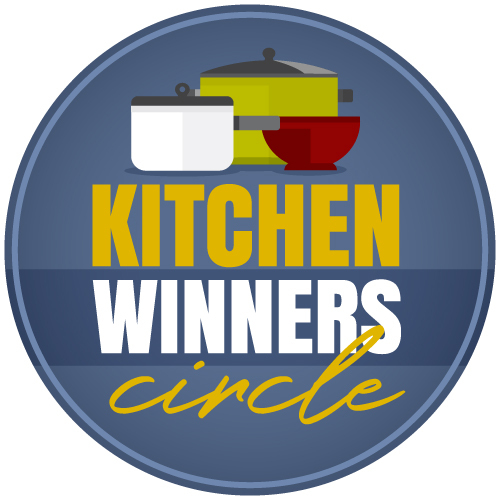 I’m another fan of the pressure cooker! Same recipe, but I add 1/4 c oil and pressure cook for 45minutes sharp. I don’t soak the beans. Hey Jessica, I know you’ve been updating many of your recipes to include Instant Pot directions. Any chance you’ll be updating this one soon? Thanks for sharing your recipes with us, I’ve got a batch of beans going right now to enjoy at dinnertime. Have a great day! Soon-ish. There are over 1400 posts on the site and we’re updating them all. Eek. That said, I do pintos for about 24 minutes.